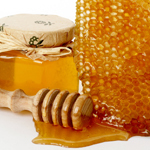 As a natural sugar, honey may be a preferred sweetener for many health conscious moms. However, raw honey is not for everyone. The American Academy of Pediatrics recommends that raw honey not be given to infants under one year of age because of the rare possibility of being infected with the bacteria that causes botulism (Clostridium botulinum). Once a toddler reaches one year old, their digestive system is mature enough to kill any botulism germs. Infant botulism is a rare illness, affecting only about 100 infants per year in the United States. Most babies will recover fully with proper medical care.